Brain injuries usually result from impact or trauma to the brain that can lead to a variety of medical problems, depending on the nature of the injury. Any significant impact or trauma to the head should be checked out by a doctor. Brain injuries may result from penetrating wounds or damage associated with impact. Penetrating wounds may be caused by foreign objects (for example, a bullet) or skull fragments that cause damage to brain tissue. Impact injuries might be the result of hitting the head with force against a hard object, like the windshield of a car, or of being hit by a hard object, such as a baseball. Skull fractures may allow bacteria * access to the brain, leading to dangerous infections. The most common type of brain injury results from minor trauma. Such injuries usually do not involve loss of consciousness (being "knocked out"). More serious brain injuries may occur with or without a skull fracture as a result of impact trauma. 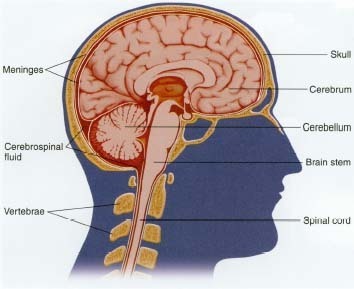 The brain is surrounded by a liquid called cerebrospinal (se-REE-brospy-nal) fluid (CSF). The CSF acts as a cushion to absorb some of the force of impact. Unfortunately, in the course of an impact injury to the head, the brain can shift, and tissue damage can occur, especially from rapidly speeding up or slowing down—much like what happens to Jell-O in a container that is dropped or suddenly yanked. The brain damage may be at the point of impact, opposite the point of impact, or spread across any of the areas of the brain. The delicate nerve tissues, the blood vessels, or the membranes surrounding the brain, called the meninges (men-NIN-jeez) may be torn or injured. The damage may result in abnormal brain activity, cerebral hemorrhage * or cerebral edema * . Because the skull is rigid and there is only limited room inside it, the swelling brain causes increasing pressure inside the skull, which can force brain tissue to press directly against the inside of the skull, resulting in more damage. There are many causes of brain injury. One of the most common causes is motor vehicle accidents. Impact to the skull may be caused by the head striking the windshield or dashboard as well as by loose objects in the car. "Whiplash," a sudden, quick movement of the head back and forth (like cracking a whip), also can produce the kind of forces associated with impact. Head injuries also may result from falls from bicycles, skateboards, roller skates, or roller blades or during sporting events, particularly when a helmet is not worn. Head injuries also may result from slips, trips, or falls. Anytime there is trauma to the head, the possibility of brain injury is present, and a doctor should be consulted immediately if there is any change in level of consciousness, balance, ability to move, memory, or vision. Not all brain injuries are the result of trauma. The brain can be damaged by lack of oxygen, as with drowning or near-drowning, or a particularly difficult birth. The brain can also be damaged through starvation, vitamin deficiencies, or certain other types of malnutrition. Toxins, such as heavy metals (like lead), can irreversably damage the brain. A wide variety of medical illnesses can also have an impact on the brain and central nervous system. * bacteria (bak-TEER-ee-a) are round, spiral, or rod-shaped single-cell microorganisms with a distinct nucleus that commonly multiply by cell division. Some types may cause disease in humans, animals, or plants. * hemorrhage (HEM-o-rij) is bleeding usually due to damaged blood vessels. * edema (e-DEE-ma) is the abnormal accumulation of fluid in body tissues, such as the swelling that occurs after a sprained ankle or other injury. What Are the Signs and Symptoms of Brain Injury? Impact to the head may cause leakage of fluid and blood from blood vessels in the scalp, forming a painful lump. A stronger blow can tear the meninges, the protective membrane surrounding the brain, or injure the brain tissue itself. The bleeding and brain swelling this type of injury can produce may lead to increased pressure within the skull, resulting in a variety of problems including concussion and permanent brain damage. not show up for hours or days. In the event of any type of head injury, it is important to gather as much information as possible about the accident. Anyone who witnessed the accident should provide details about exactly what happened and how the injured person acted after the accident. Temporary amnesia (am-NEE-zha), or loss of memory, is common with many brain injuries. It is typical for the injured person not to remember what happened immediately before, during, and immediately after the accident. Brief periods of amnesia may occur during the recovery period after brain injuries. Longer-term amnesia is not common, except when a head injury is severe. * seizures (SEE-zhurz) are "storms" in the brain that occur when the electrical patterns of the brain are interrupted by powerful, rapid bursts of electrical energy. This may cause a person to fall down, make jerky movements, or stare blankly into space. * double vision is a vision disorder that causes a person to see two images of a single object. Cognitive effects of brain injury may include short-term or long-term memory loss, inability to learn new information, trouble concentrating or staying focused, speech or communication difficulties, disorientation in space, problems in organizing aspects of daily living, impaired decision-making, and inability to perform more than one task at a time. Steve Young, star quarterback for the San Francisco 49ers, is knocked to the ground during a football game. In 2000, after 13 years with the team, Young announced his retirement due to the series of head injuries he sustained on the field. of the sense of taste or smell, slow or slurred speech, minor or severe headaches, balance problems, and tiredness. Emotional effects of brain injury may include anxiety (ang-ZY-e-tee), depression or mood swings, denial of having any problems, impulsive behavior, agitation (a-je-TAY-shun), and changes in personality. Anyone who suffers minor head trauma without loss of consciousness or other associated neurological * symptoms still should be watched closely. The injury may or may not be followed by symptoms such as vomiting, paleness of the skin, irritability, or sluggishness. If any of the symptoms last more than 6 hours or if they worsen, the symptoms may indicate a more severe injury. A doctor should be consulted immediately for an in-depth evaluation. * neurological (nur-a-LAH-je-kal) refers to the nervous system, a network of specialized tissue made of nerve cells, or neurons, that processes messages to and from different parts of the human body. A skull fracture, or injury to the bony structures protecting the brain, may or may not result in any neurological symptoms. In some cases the skull may have a noticeable depression (a "pushed in" appearance, like a dent), or there may be significant swelling or bleeding from the overlying scalp. Fractures may cause bruising or tearing of brain tissue, or blood vessels on the meninges. The injured person may have seizures as a result of the injury. A doctor should examine the person if there is any possibility of skull fracture. A concussion (con-CUH-shun) is a bruise-like injury to brain tissue caused by a direct blow or violent shaking. A concussion usually is associated with amnesia or a change in level of consciousness that lasts a few seconds to a few minutes after the trauma. The patient typically shows no other signs of neurological problems immediately after the trauma, but a condition known as postconcussion syndrome might follow a minor head injury. Patients with persistent post-concussion symptoms sometimes enter the hospital for observation. These symptoms include headache, dizziness, difficulty concentrating, varying degrees of amnesia, depression, apathy (a lack of interest or feeling), nausea, and anxiety. Repeated concussions are dangerous and may put the person at risk of sudden death. Contusions (con-TOO-zhuns) and lacerations (la-se-RAY-shuns), which are bruises and cuts to tissue, are serious problems when the brain is affected. Brain contusions and lacerations often are associated with serious head trauma that causes severe surface wounds and skull fractures. The symptoms a person shows depend on the part of the brain that is affected. Severe contusions and lacerations generally are associated with signs of brain swelling. The initial trauma also may cause paralysis or even coma * for several days to weeks. A hematoma is a localized mass of blood in tissue. The swelling and the "black and blue" appearance of a bad bruise are caused by just such a leakage of blood from damaged blood vessels in the injured area. Unlike most of the rest of the body, the skull restricts swelling, so the increased pressure caused by the bleeding is transferred to delicate brain tissues. In the brain, hematomas cause different symptoms depending on where in the brain they are located. Bleeding from injury to blood vessels within the brain tissues may cause an acute subdural * hematoma. This kind of hematoma begins forming immediately after injury and is common in severe head injuries. It causes growing pressure within the skull that eventually can lead to coma and even death. Some subdural hematomas are formed by very slow blood vessel bleeding, and so they may not produce symptoms for several days or even weeks after the injury. The symptoms may be overlooked because of the time lapse between the injury and the appearance of symptoms. Symptoms may include daily headaches that slowly increase in severity, impairments in aspects of thinking and memory, changing levels of drowsiness and confusion, and gradual paralysis on one side of the body. * coma is an unconscious state, like a very deep sleep. A per-son in a coma cannot be awakened and cannot move, see, or speak. * subdural (sub-DOO-ral) means under the dura, the covering of the brain. * epidural (ep-l-DOO-ral) means above or outside the dura, the covering of the brain. Epidural * hematomas occur when blood coming from arteries is trapped between the membranes covering the brain and the skull. The symptoms of an epidural hematoma usually develop within hours of the injury. Symptoms may include worsening headache, growing loss of consciousness, loss of motor skills * , and fixed gaze of one or both eyes, with dilated (widened) pupils. Epidural hematomas are less common than subdural hematomas, but they require prompt medical attention because the bleeding can quickly compress the brain and cause permanent or fatal brain damage. How Do Doctors Diagnose and Treat Brain Injuries? The severity of brain injuries may be difficult to determine accurately. Doctors must evaluate all the symptoms, listen to descriptions of the accident from both the injured person and witnesses, and rely on a variety of tests and procedures to make a diagnosis. The problems of diagnosis are even more complicated when the patient is unconscious or suffers from amnesia. The diagnosis begins with physical examination. The doctor checks the state of consciousness, breathing patterns, pupil size and the pupils' reaction to light, and movement of the eyes and limbs. Doctors may perform x-rays to find fractures of the skull. In addition to x-rays, doctors use special imaging studies, such as computerized tomography (CT) scans or magnetic resonance imaging (MRI), to reveal detailed information about the brain itself. CT and MRI tests show whether there are structural changes in the brain, such as hematomas. A procedure called an angiogram, which is a kind of x-ray of the blood vessels, sometimes is used to see where blood vessels may be ruptured, or torn. In some cases, carefully observing the patient over several hours is important, because in some neurological conditions symptoms can be delayed and then appear suddenly. A neurologist or neurosurgeon (a doctor who specializes in injuries and surgical problems of the brain) may review all of this information. Based on the details surrounding the accident and the results of the physical assessment and the various medical tests, the doctor chooses the best course of treatment. Skull fractures themselves seldom require special treatment. In most cases, the fracture will heal by itself over a period of time. In severe or penetrating cases of skull fracture, surgery may be required to remove fragments of the skull that may have been pushed into the brain. * clots are jellylike masses of congealed blood that stop blood flow. * speech-language pathologists (pa-THAH-lo-jists) are professionals who are specially trained to test and treat people with speech, language, and voice disorders. * physical and occupational therapists are professionals who are trained to treat injured people by means of activities designed to help them recover or relearn specific functions or movements and restore their abilities to perform the tasks of daily living. Surgery is one method of treatment for injuries such as hematomas. Attempts to stop the bleeding associated with epidural hematomas usually are done as an emergency procedure to prevent further brain damage from increased pressure in the skull caused by the bleeding. Epidural hematomas may require repeated operations to remove blood clots * . Damage to brain tissue cannot be repaired by surgery or medicine. The harmful effects of brain injuries respond best to aggressive treatment by rehabilitation teams typically made up of specially trained physicians, psychologists, physical therapists, speech-language pathologists * , physical and occupational therapists * , and other professionals. Patients must be monitored constantly and their condition reevaluated as their behavior and symptoms change. What Are the Long-Term Effects of Brain Injury? Recovery from a minor brain injury, such as a concussion, usually takes a short period of time (3 to 6 months), and the recovery often is complete. For more serious injuries, degrees of recovery vary. Factors that predict good recovery are the patient's age (younger is better), duration of coma (longer is worse), presence of bleeding in the brain, and the site and amount of trauma to the head and brain. Patients who survive severe brain injury often face a long recovery process (years) and are left with permanent disabilities. Rehabilitation programs help patients regain their cognitive and emotional faculties. During the rehabilitation process, it is common for patients to have lapses of memory, behavioral changes, emotional problems such as anxiety or depression, changes in sleep patterns, declines in intellectual ability, and seizures. Psychological counseling and brain injury support groups are available to help patients and families deal with the long-term rehabilitation process. Patients who end up in a coma or a persistent vegetative state (PVS) usually have the most severe types of brain injury. In these types of injury, the cognitive centers of the brain are badly damaged while the brain stem that controls bodily functions remains intact. The PVS can last for many years. During the PVS, patients are not mentally aware of their surroundings but they still have basic reflexes and sleep cycles. Patients in a PVS that lasts longer than 3 months have a slight chance of some amount of recovery, while patients in a PVS for more than 6 months rarely recover. How Can Brain Injury Be Prevented? Most brain injuries are the result of accidents or falls. Wearing safety belts in cars and helmets when using wheeled vehicles, such as bicycles and skateboards, can prevent many of these injuries. Learning and observing safety practices is important. Wearing a safety belt in the front seat of a car prevents the wearer from hitting the dashboard, steering wheel, or windshield. Wearing seatbelts in the front seat or backseat keeps the wearer from being thrown around inside the vehicle or thrown out of the vehicle. Wearing a helmet while riding a bicycle or motorcycle or using a skateboard or skates helps protect the rider from injuries during falls. The helmets should be tight fitting and padded and have a chin strap. It is also important to wear helmets while playing contact sports such as football. Even in sports such as baseball, helmets should be worn whenever there is a possibility that the ball could strike the head. Every year more than 750,000 people in the United States are injured while playing recreational sports. About 82,000 of these are traumatic brain injuries. Players of almost any sport can be injured, but those who play football, soccer, or ice hockey or those who wrestle or box may be most in danger of severe brain injuries. In just one playing season, as many as 10 percent of college football players and 20 percent of high school football players may have serious head injuries. Sports players who are hit in the head repeatedly, like boxers, may have permanent disabilities as the result of many injuries to the brain. The American Medical Association thinks that the danger is so grave that they have repeatedly called for a ban on boxing. Some professional boxers have a condition called "punch-drunk syndrome," which slurs their speech and makes them unsteady on their feet. Boxers who are punch-drunk also may have memory impairment and difficulties in concentrating or communicating. Muhammad Ali, three-time world heavyweight boxing champion and Olympic gold medalist, has parkinsonism, which may have resulted from his years in the ring. A person with parkinsonism usually has muscle rigidity, tremors, and twitches that may make it difficult to walk or even to talk. In severe cases, parkinsonism also may affect a person's mental abilities. Levy, Allan M., and Mark L. Fuerst. Sports Injury Handbook: Professional Advice for Amateur Athletes. New York: John Wiley and Sons, 1993. Covers head and neck injuries, with separate chapters on sports with the highest risk of concussion. Head Injury Hotline, 212 Pioneer Building, Seattle, WA 98104-2221. This nonprofit organization is a clearinghouse for wide-ranging information on brain injury. They maintain a research library at their website and provide fact sheets as well as up-to-date news on health resources, support groups, rehabilitation facilities, and much more.